We are one of the reputed manufacturers, suppliers & exporters of a varied range of Electrical products for Earthing, Lightning protection. The entire product range is manufactured from finest grade raw material using the most advanced technology. It is appreciated for its outstanding quality and durable make. 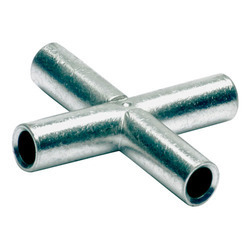 Tap Connectors Tee off Crimping Type: Aluminium two part split tube, sliding fit connectors, grease filled and individually packed with welded Aluminium Tubular tap. Suitable for all types of Aluminium conductors. For aluminum to aluminum or aluminum to copper conductor tee combinations. Uses the same installation tools and dies. Color coded end plugs for easy die selection. For use with conventional tooling. Meets the standards of Substation tee connector is designed for limited space application as found in substations. Run length is shorter than conventional tee taps which saves space and allows faster installation. Tee tap is installed with standard ACA hex dies. Tap Connectors Tee Off Crimping Type: Aluminum two part split tube, sliding fit connectors, grease filled and individually packed with welded Aluminum Tubular tap. Suitable for all types of Aluminum conductors. 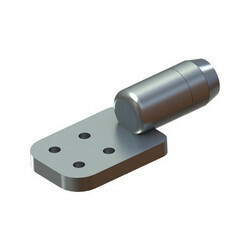 Substation tee connector is designed for limited space application as found in substations. Run length is shorter than conventional tee taps which saves space and allows faster installation. Tee tap is installed with standard ACA hex dies. Looking for Aluminium and Copper X Connectors ?